You will never get ahead as long as you are trying to get even. Never! Jesus said, “Make the first move; make things right,” because grudges will hold you back. When you have been wounded by a friend’s betrayal, a partner’s unfaithfulness, a boss’s unfair treatment, or a parent’s hurtful words, unforgiveness will cost you more than just your temper. It will damage your relationships, kill your productivity, accelerate the ageing process, cause anxiety and depression, contribute to heart disease and arthritis, and rob your life of its zest. 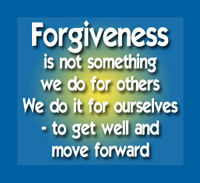 Forgiveness, on the other hand, wipes the slate clean and reverses much of the damage that has already been done. People who forgive, experience increased self-esteem and reduced anxiety. I agree that forgiveness does soothe your own heart even you know that your counterpart never cares or is even already dead.